What was Mozart really like? Was he "a flawless and infinitely good man", as his admirer Tchaikovsky believed? Or was he, as Goethe secretly feared, a man "in the grip of the demonic spirit of his genius"? 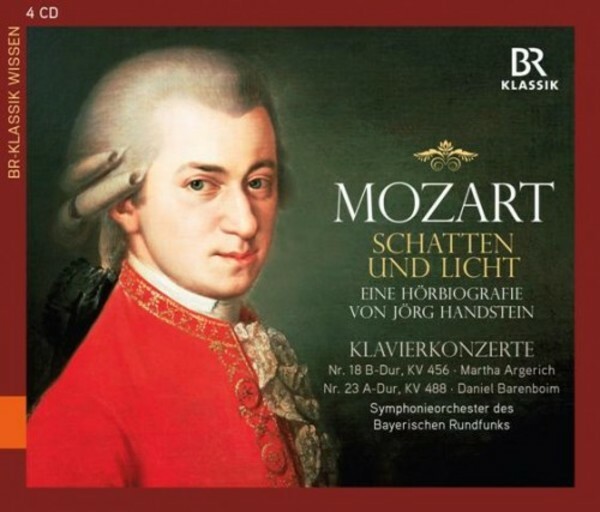 This audio biography lays no claim to solving the riddle of Mozart either, but it does bring the composer to life � in his thoughts and feelings, his everyday life and his era, as embodied by the Viennese actor Florian Teichtmeister, and strictly according to original source material. The narrator is Udo Wachtveitl, while the author is J�rg Handstein, who has already retraced the lives of Mahler, Wagner and Verdi in the form of audio-biographies for the BR-KLASSIK Wissen series. The audio biography is enhanced by the two Piano Concertos No.18 and No.23, played by Martha Argerich and Daniel Barenboim, accompanied by the Symphonieorchester des Bayerischen Rundfunks under Eugen Jochum and Rafael Kubelik.